Before you read the rest of this column, please read this article previously shared by DCI Hall of Fame member Dennis DeLucia: Read How the Bridgemen Became the Bridgemen. Okay…now that you're back, we'll go forward with a look back at the year the Bridgemen hit the scene big time and changed the drum corps activity with its unique brand of showmanship. Despite placing in the DCI World Championship Finals in 1972 (11th) and 1973 (9th), many people had already pretty much written off the Bridgemen by the 1975 season. A 1974 finish of 26th was followed by a 1975 season so disastrous that the corps decided not to go to the World Championships in Philadelphia. And then came along show coordinator Bobby Hoffman with ideas that were so radical, some people proclaimed the corps' new style was sacrilegious to drum corps. 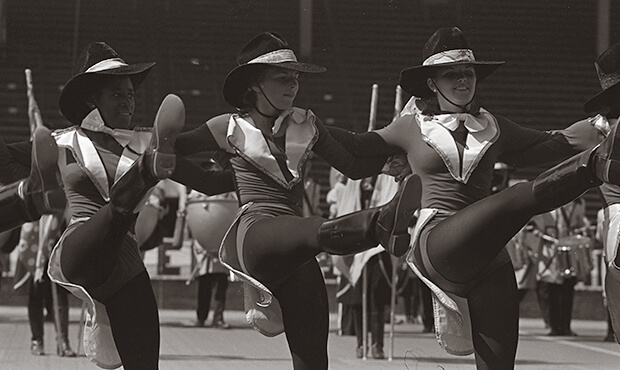 The show started traditional enough, even more so than most other corps in 1976. Off on the left goal line, which previously was how all corps had to step off, the long yellow jackets that reached down to the members' kneecaps formed a solid wall that gave little indication to the metaphorical drum corps wall that was about to be torn down by Larry Kerchner's brass charts, Dennis DeLucia's drum book, and Hoffman's visual design. Rossini's "William Tell Overture" was one of the most traditional drum corps works any corps could have put on the field. It was as if Bobby Hoffman was giving a nod of the corps' new-style hats to the Bridgemen of past years. (The piece had been performed as the corps' opener in 1973, the last year the corps had made the Finals.) The flags were psychedelic representations of the Bayonne Bridge, which connected the corps' hometown of Bayonne to Staten Island, and which upon completion in 1931 was the longest steel arch bridge in the world. The horns then "dismounted the horse," a sly reference to the fact that "William Tell Overture" was better known to American audiences as the theme from the old television serial, "The Lone Ranger." A rather short percussion break of Sonny Rollins' "St. Thomas" led into the beginning of Chuck Mangione's "Land of Make Believe." Drums had formed a circle with all looking toward the center. This meant that some of the drums had their backs to the audience, which frankly, was unheard of in "proper" drum corps (ahem) circles. Performance excerpt of the 1976 Bridgemen. And circles were a Hoffman favorite. After the drums broke out of their form, the flags formed a circle around the drums, with the rifles forming a smaller circle in the front of the form. The brass players then formed a large circle around everyone else, the circle broken for the rifle circle. The color guard, instead of loading up on equipment work, participated in a dance groove until the big hit in the piece, when flags and rifles became activated more like props than traditional guard equipment. 1976 was the nation's Bicentennial year, and so Sousa's "Stars and Stripes Forever" gave Bobby Hoffman a reason to have eleven guard members open their coats wide to reveal "1776" and "1976" across eight of the members, with the remaining three members accenting the proclamation with some stars. Yes, it was as hokey as it could possibly be, and the audience, finally realizing they were witnessing a drum corps paradigm shift, enthusiastically started to get in the groove. The only thing that seems to not be innovative from the perspective of today is the fact that the flags never changed. 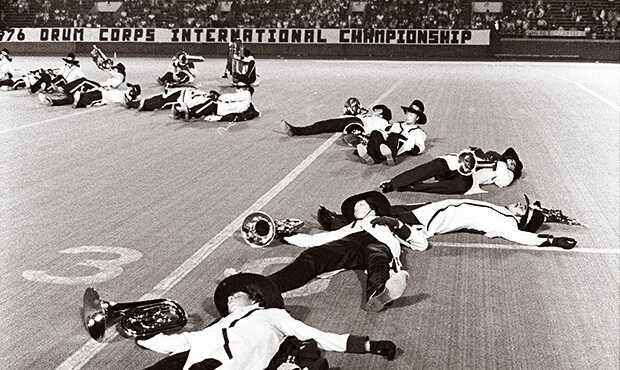 Back then, corps were not yet allowed to have any equipment laying on the field. Therefore, the only way Hoffman could introduce new color was with the banners under the coats that spelled out the years mentioned above. Another percussion break, based on Georges Bizet's "Farandole," brought the corps to the final part of the show, music from "A Chorus Line," which had just opened on Broadway the previous year. "What I Did for Love" segued into "One," which had 22 members of the guard strip down to skimpy dance leotards behind the cover of the flags, revealing new red uniforms for a big kick line finale. Members of the horn line were ingeniously brought next to the dance line members so the discarded guard uniforms could be hung on their backs, getting around the rule that nothing could be set on the field. The front line of the brass section then knelt on the field, laid back and belted out the final notes. Then upon completing the show, knelt back further and with everyone else in the corps, stunned the audience with the famous Bridgemen "fall" that is discussed in DeLucia article linked in the first paragraph. Many in the audience didn't know what to make of this corps that seemed to be thumbing its nose at the established traditions of drum corps, but they knew they had just witnessed something that was destined to change the activity as we knew it. This week only, you can save on 1976 World Championship Audio and Video Performance Downloads on the DCI Fan Network. Buy the 1976 Bridgemen Video Performance Download. (Available this week only for $3.99. Regular price: $4.99.) Buy the Audio Performance Download bundle of all 12 Finalists from 1976. (Available this week only for $15.99. Regular price: $19.99.) Offer ends Monday, Nov. 28 at 8:30 a.m. ET.